The same economic factors that have choked dealer credit for the past year also have frozen an increasingly important source of auto credit: asset-backed securities. Issuance of the securities plunged in September 2008 and virtually stopped the month after. The entire year proved to be the worst for auto-related issuances in more than a decade. But now there appear to be signs of a thaw, thanks to the Federal Reserve Bank of New York's TALF, or Term Asset-Backed Securities Loan Facility. Since March the Fed has been making dozens of loans to holders of some AAA-rated asset-backed securities, including Bank of America, Ford Motor Credit Co. and the United Services Automobile Association, or USAA. "The story of 2009 was pretty strong, and TALF was definitely a success from an issuer standpoint," said John Bella, a Fitch Ratings managing director. 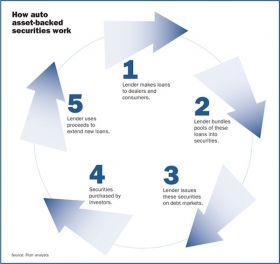 Asset-backed securities, which are bundled pools of auto loans to consumers and dealers, are sold by lenders on bond markets to pension funds, insurers, mutual funds and endowments. In recent years, proceeds from the sale of the securities had come to supply most credit extended by domestic captive finance companies, analysts said. The TALF loans helped jump-start the U.S. market for asset-backed securities. As of early November, issuance of the securities was up 39 percent from the $35 billion posted for all of 2008, according to the finance industry newsletter "Asset-Backed Alert." 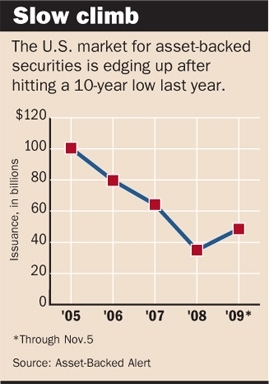 Still, 2009 appears likely to end as the second-lowest year of the decade for issuance of asset-backed securities, with less than half the 2005 peak of $100.5 billion. "Consumers aren't taking out loans, and dealers aren't selling vehicles, so you can't originate a security for something that's not there," said Moody's analyst Mark DiRienz. Under TALF, the Fed is to lend up to $200 billion through March, when the program is set to expire. Although the securities issued have to be AAA-rated, TALF recipients don't have to be prime lenders. Dozens of financial institutions have received TALF funds this year, all but two of them prime lenders, according to Moody's. The subprime exceptions: AmeriCredit and CitiFinancial. "You've got to take baby steps to re-establish investor confidence because of the losses they've incurred," said Fitch analyst Christopher Wolfe. "More of the prime market will have to come back before you see sustained issuance in the subprime market." The market for asset-backed securities won't come back in a big way until the economy resurges, although analysts see some optimistic signs. In November, there were more non-TALF issuances of asset-backed securities than in any other month of the year, as credit spreads narrowed. Said Moody's DiRienz: "The market feels less risky out there, for whatever reason."